Well NVIDIA is not going to be happy about this leak. A site called UK Gaming Computer got an early access to first Maxwell-based samples, and decided to do a small preview (luckily for us). To start off, the picture you see above shows the reference design by NVIDIA. We’ve already seen this design in Chinese leak, but we did not know these are actually showing reference models. Moving on, we should also say that both cards have no power connectors. This information was also leaked few weeks ago. 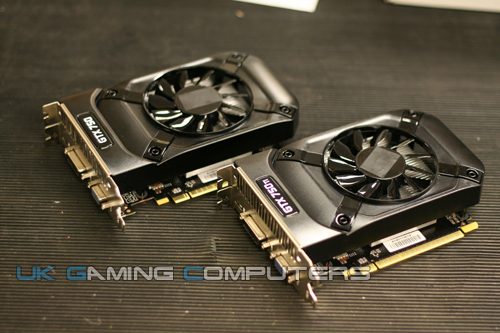 The lack of power connectors means that both GTX 750 Ti and GTX 750 will draw power only from the PCI-E slot. This is most likely be the biggest change compared to Kepler cards. 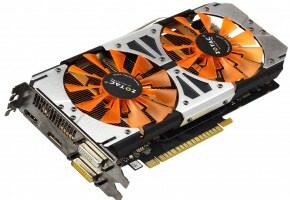 Both GTX 750 Ti and GTX 750 are based on GM107 GPU, the first Maxwell graphics processor. 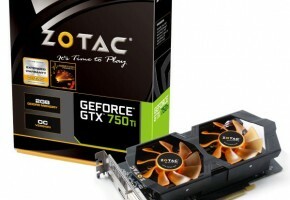 The 750 TI will sport 960 CUDA cores, 80 TMUs and 16 ROPs. 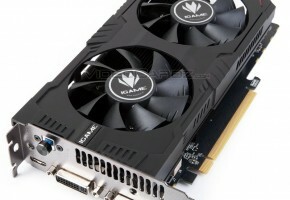 The card is equipped with 2GB GDDR5 memory and 128-bit interface. In terms of clocks, we are looking at 1050+ MHz specs, but the exact clockrates are not known since the samples in this preview are factory-overclocked. 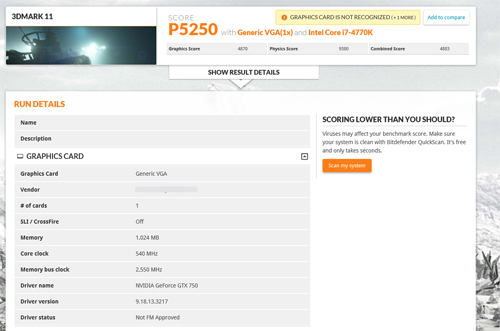 The GTX 750 has 768 CUDA cores, 64 TMUs and 16 ROPs. Compared to 750 Ti we have 1GB memory less. 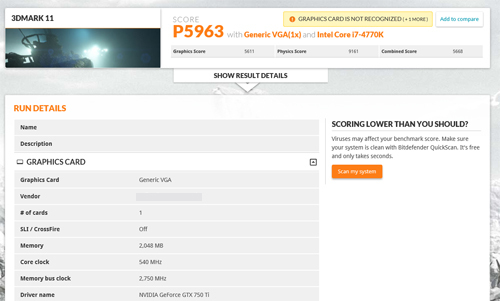 At this point we don’t know if 960 CUDA cores is the full GM107, but I would be surprised if not. One thing is certain though. The GM107 is not a GK107 replacement, but GK106. As mentioned above, the clock speeds are not from reference models. I already know that some cards from other manufactures are clocked at 1059 MHz, and they are still called ‘OC’, so the real frequency is somewhere between 1000 and 1050 MHz. Comparing factory-overclcoked cards to their predecessors from 600 series is quite pointless, but the leaker decided otherwise. 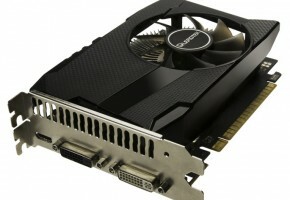 According to UK Computer the GTX 750 Ti is 23% faster and GTX 750 is 9% faster than GeForce GTX 650 TI. The drivers are not yet fully supporting these cards, so the leakers had to use different versions for each series. 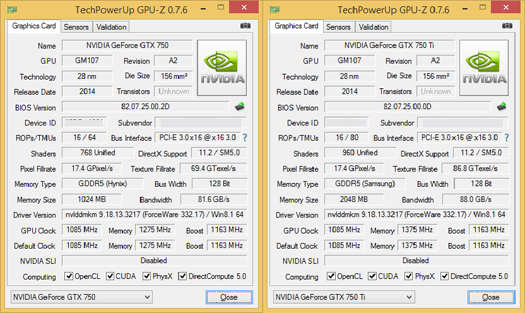 It’s also worth noting the difference between GTX 750 Ti and GTX 660. The lack of 64bit width on interface and 8 ROPs definitely makes the Maxwell card slower. 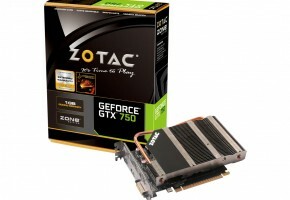 NVIDIA will probably advertise 750 Ti as 650 Ti replacement, and 750 as 650 (no surprises here), but the specs are so different I thought it should be 650 Ti and 650 Ti Boost instead (hence, these cards are in the specs table). Both cards will be released on February 18th. Prices remain unknown, but keep checking VC, I will do my best to confirm them.